With the British weather threatening to put a dampener on the Olympic games, why doesn't the government just make the sun shine? At the risk of sounding like a mad scientist unveiling a doomsday device, it can be done. In theory at least. The Chinese government seeded clouds ahead of the 2008 Olympics opening ceremony to create a downpour elsewhere and keep the stadium dry. This involved firing rockets packed with silver iodide crystals into rain clouds over the suburbs of Beijing. The technique is regularly used to boost rainfall in drought-stricken areas of China, although it has proved controversial with allegations of "rain-theft" levelled at provinces which deploy precipitation shock troops too zealously. It is also possible to "over nucleate" clouds with many particles so that they hold in their moisture until they have passed over the target area, experts say. Cloud-seeding is used around the world to prevent fog at airports, stop hail damage in cities or to boost snowfall at ski resorts. The UK has had a chequered history with the technique. Thirty-five deaths in the 1952 Lynmouth flood disaster were linked at the time to RAF rain-making experiments over southern England a few days earlier although nothing was proved. Cloud seeding was considered as a possible solution to the long drought of 1976, along with shipping water in from Norway, but is not thought to have been attempted. Bruce Boe, director of metereology at US company Weather Modification Inc, which specialises in cloud seeding and other techniques, said stopping the rain for the duration of the London Olympics would be extremely difficult as it would be subject to a "dynamic" frontal weather system. He said his company had been contacted by a major British music festival two years ago about the possibility of cloud seeding but when the complexities were explained to the organisers and the fact that "we could not provide any guarantee that we could make it not rain" they decided against it. To stop rain spoiling the Olympics would require a fleet of light aircraft, which could interfere with commercial flights, and a vast quantity of chemicals, said Mr Boe, and was probably "best avoided". "It is hard for me to believe that the Chinese cloud seeding was solely responsible for the fact that there was no rain during their games. They may have had an element of good fortune," he told BBC News. "You are always trumped by mother nature at one time or another." Other experts are not so pessimistic. Jim Dale, senior risk meteorologist at British Weather Services, says it is theoretically possible to modify weather in the UK - but one major stumbling block, apart from the expense, is that it simply shifts the rain elsewhere. He told BBC Radio 5 Live: "In our case we would be trying to make it rain in Reading or Slough rather than London." 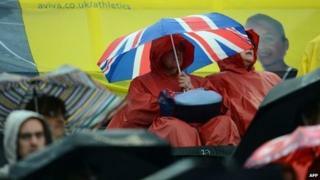 The long-range weather forecast for the Olympic games suggests they will not be a complete washout. The intense downpours much of Britain has seen in recent weeks will be replaced by more "changeable" conditions, with occasional sunny days, says the Met office. Besides, argues Mr Dale, it would not be a British summer without the occasional downpour. Boris Johnson, writing in the Daily Telegraph , said his favourite meteorologist had predicted a "deluge" during the entire Olympic period, but the London mayor urged the weather to do its worst, adding: "We like a spot of precipitation. It intensifies the pleasure of the sun. Made us what we are." Opening ceremony director Danny Boyle has even arranged for rain clouds to be conjured up in the stadium in the unlikely event that the elements do not provide the real thing. Some believe there is something vaguely sinister about the idea of tinkering with the weather. It is hard to picture David Cameron, on the roof of Downing Street, pointing at a glowering sky like a Norse god, and crying: "Make it rain." But, oddly enough, the prime minister might not be a complete stranger to the concept. Back in the days when the Tory leader used to tell his party to "let the sunshine in", his closest policy adviser, Steve Hilton, reportedly floated the idea of buying in "cloud-bursting technology" to extend the British summer. The policy guru, who recently departed for the US, believed a sunnier climate would make us all happier and more productive. The idea was dismissed as crazy by hard-headed Westminster pundits and, no doubt, Mr Hilton's more down-to-earth colleagues. The Met Office told BBC News they were not aware of any plans to use cloud seeding to keep rain away from the Olympics, while the Department for Culture and Media and Sport said it was "almost certain" it had not been discussed. But if the weather over east London suddenly starts improving on 27 July - and there are torrential downpours in Berkshire - who is to say the PM's aptly named blue sky thinker did not get his way after all? Keep watching the heavens.